How many times do you remember the ache of frustration because you started a diet that you couldn’t stick with? How often did you see friends getting fantastic results from the same exercise schedule that you found impossible to bend your life around? And think of that someone you know whose very life depends on a few simple changes that they just can’t seem to make. It’s heart wrenching if you stop to think too long. And the worst part: you probably think it’s your fault, or that your loved one just doesn’t care enough. The truth is, there’s a powerful force that puts us on a PATH that we simply can’t break away from unless we understand what’s at work. I’m like you. I think about my health. Am I too fat? Is my cholesterol too high? As I age, will I suffer from dementia or Alzheimer’s? And when something feel’s wrong, should I go see the doctor and even if I do, will I trust his or her judgment? The way I answer these questions is influenced in a way I didn’t expect when I started my research 30 years ago. Not too long into my work, I had just had my third daughter and as I watched all three grow, I could see how each one developed a different attitude about their health. One cared only when she become noticeably ill and never took an interest in exercise. My second daughter couldn’t sit still, took up running, gymnastics, resistance training and paid attention to her diet. And my oldest daughter just didn’t seem to think about it all. And now with my family, even my 80 year old mother, I can help them to shape their path to lifelong health and wellness. The problem we’re facing today is that. No one else understands these principles. Why does one person struggle to adhere to an exercise routine while another finds it second nature? Why does one individual avoid planning about health issues while another is almost obsessive about researching health? Are our innate health-related behaviors set in stone, or do they adapt as age and circumstances change? Is it possible to change these behaviors? I studied the answers to these questions for most of my adult life and discovered something suprising. Most people fall into one of nine patterns that pre-determines how they’ll feel about vigorous exercise, diet, medical help and other health-related behaviors. Let me show you your pattern and you’ll find your answer. 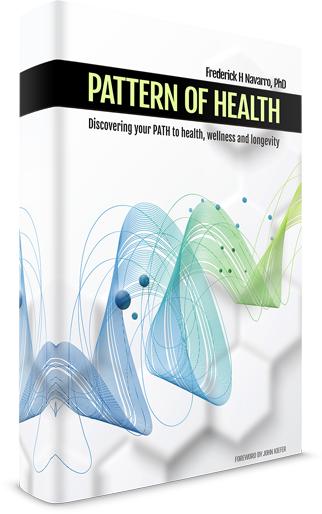 The concept I developed is called Patterns of Adapting To Health or PATHTM for short. PATH is invaluable to understanding your own health related behaviors. Once you know which PATH is yours, you can more easily see which behaviors are easiest or most difficult to change. It’s also a priceless tool that gives healthcare practitioners critical insight into their patients, to help them talk to patients in ways that will resonate and most likely spur change. In many ways, PATH works like any other map. Simply put, you can’t devise a plan for reaching a destination without knowing your starting point. The PATH book gives you everything you need to determine your health pattern so you know your starting point. Chances are, you’ll recognize yourself in one of the nine PATHs before even completing the questionnaire. And once you know which PATH is yours, you’ll find it far easier to see your strengths and weaknesses to change health behaviors for the better. PATH gives you the self-awareness you need to disrupt negative behaviors and reinforce those that are positive. Don’t miss this chance to learn the drivers behind your health behaviors and of those around you. PATH is indispensible information for individuals, healthcare professionals—anyone concerned with health and healthcare outcomes. It is time for everyone to hear about a powerful unknown factor shaping his or her health. I have been studying this factor for the majority of my adult life. After sharing this research with many national health plans and hospitals since 1995, and spending years testing and validating the health impacts of this hidden factor and witnessing their power, it is now time for everyone to learn about this powerful factor shaping their health and the health of those they love. I can say with certainty that if you have trouble starting or maintaining exercise, you need to read this book. If you suffer from a variety of illnesses requiring an above average number of visits to the doctor, you need to read this book. If you are always looking for health information to learn about new health treatments you need to read this book. The secret factor is the effects of patterns, patterns we follow without being aware we do. Right now, you are a slave to one or more of these patterns. I wrote this book to begin the process of freeing you from their effects. Dr. Frederick Navarro is a professional health researcher with over 20 years of experience in national and international health research, a PhD in health psychology, and an MA in psychological research. After an early career in healthcare marketing research as a manager and director, Dr. Navarro, in partnership with national health plans and hospitals, spent the next decade studying and researching health-related behavior relationships to health, physical activity, health literacy, and conditions such as high blood pressure, obesity, diabetes, and affective disorders. The crowning achievement of Dr. Navarro’s research was the development and discovery of the Patterns of Adapting to Health (PATH). Validated by over a quarter-million adult interviews from throughout the U.S., the PATH represent different patterns or trajectories of adaptive health behavior adults unconsciously adopt early in adult life, and which subsequently shape their health, health risks, and demand for health care services through all life stages. When it comes to overall healthcare, patient compliance is one of the most important drivers of outcome. For example, it is commonly known among providers that a majority of patients rarely take prescribed medication as directed. Using Patterns of Health has long-standing implications in helping health care providers achieve better compliance by approaching patients according to their pattern. This approach certainly can help ensure that recommendations made are more closely adhered to by patients, which in the long run can improve health quality as well as potentially save the health care system money at the same time. Exceptionally well researched and very readable; I was impressed. The best book I have read so far on the topic of questioning our health problems and the patterns we make. I also appreciated the careful explanation of research data and how misleading conclusions are created/factual results are overlooked. Great writing, article selection, and editing. A standard text for good reason. You can't go wrong, whether you're teaching or learning about why people with illness may be successful with one treatment plan and unsuccessful with others. Simply a must-have. Dr. Navarro has done an excellent job of inviting us to truly examine our own decision making when it comes to health care, exercise, and sticking to our way of doing things. This is a very well written book, succinct and engaging. I highly recommend this thought provoking work. This writer has taken some of our most frequent mistakes in the domain of fitness and diet and given examples to open our eyes. He shows us the patterns we are on and how we can change them to help ourselves. He has in fact given us tools to help in everyday life. We offer Support on products shown on this site. If you have any technical problems we would love to have our Tech Specialists help you out. Please send all support questions to: support@quantum.house.